Rajeh A. Saadeh, the founder and sole member of The Law Office of Rajeh A. Saadeh, L.L.C., devotes a substantial portion of his litigation practice to matrimonial and family law and handles all issues pertaining to divorce and dissolution of civil unions and domestic partnerships, including child custody, visitation, parenting time, child support, equitable distribution of assets and debts, complex valuation of businesses and professional practices, stock options, executive benefits and compensation, alimony, palimony, arbitration, and mediation. He also handles domestic violence litigation, post-judgment modification and enforcement, and drafting of prenuptial, mid-marriage, reconciliation, and divorce settlement agreements. This knowledge and experience serves Rajeh well as an appointee of the Supreme Court of New Jersey's Family Practice Committee, and he volunteers as an Early Settlement Panelist to opine to divorcing parties as to how they should settle their cases. Whether the case is leaning toward settlement or trial, Rajeh takes great pride and care in helping his clients make it through these difficult, personal, and life-changing matters. In addition to family law, Rajeh has experience litigating criminal cases, civil matters involving both law and equity, including foreclosure and condemnation cases, municipal court matters involving traffic tickets, DUI/DWI charges, disorderly persons offenses, landlord tenant matters, including evictions, violations of municipal ordinances, and appeals before appellate courts. This breadth of experience enables Rajeh to provide comprehensive representation and advice to his clients when they need it most. Aside from his substantial litigation practice, Rajeh represents clients in commercial and residential real estate transactions, and he has experience negotiating short sales, loan modifications, and forbearances with banks and mortgage holders and servicers. Related to his real estate practice, Rajeh helps property owners who desire to sell their property via short sale, are at risk of foreclosure, or who cannot make their mortgage payments. Rajeh also served as the attorney for the Board of Health in the Township of Springfield in Union County, New Jersey, and he was a member of the Planning Board in Springfield. Rajeh volunteered with Wafa House, a support center predominantly dedicated to educating and assisting victims of domestic violence. Rajeh is/was a member of the American Bar Association, New Jersey State Bar Association, New York State Bar Association, Somerset County Bar Association, Middlesex County Bar Association, Hunterdon County Bar Association, and Union County Bar Association. Rajeh previously served as the Somerset County representative, Parliamentarian, Secretary, and Treasurer of the Young Lawyers Division of the New Jersey State Bar Association, and he presently serves as the Chair of the Young Lawyers Division. 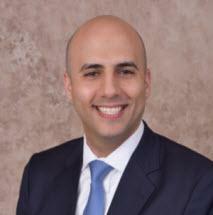 Rajeh is also a past President of the New Jersey Muslim Lawyers Association. As for the New Jersey State Bar Association, Rajeh is a member of the Diversity, Appellate Practice, and Equity Jurisprudence Committees. These affiliations and memberships help Rajeh forge the bonds and relationships to empower him to provide the most effective and efficient representation to his clients. Prior to private practice, Rajeh served as the Judicial Law Clerk to the Honorable Hany A. Mawla, a Judge of the Appellate Division who previously presided over the Family Part in Somerset, Hunterdon, and Warren Counties. During his clerkship, Rajeh obtained considerable exposure as to how litigation is handled from the trial court's perspective. This experience and knowledge enables Rajeh to serve his clients effectively throughout all stages of their matters. At the Ivy League and renowned University of Pennsylvania Law School, Rajeh A. Saadeh was elected Class Officer by his peers and received the Outstanding Pro Bono Service Award in recognition of his work with the Homeless Advocacy Project. Also while in law school, Rajeh A. Saadeh completed criminal law internships with the New Jersey Office of Public Defender and the Major Trials Unit of the Philadelphia Office of the District Attorney. At Rutgers, The State University of New Jersey, Rajeh A. Saadeh was an Edward J. Bloustein Distinguished Scholar, a member of the Rutgers College Honors Program, and a frequenter on the Dean's List. Rajeh is licensed to practice law in the States of New Jersey and New York, and he is authorized to appear before the United States District Court for the District of New Jersey and the United States Court of Appeals for the Third Circuit.